← “To a Walnut Dask”, Part II, The Writing Compartment. Whatever your persuasion and situation, I wish you all well during the festive season. 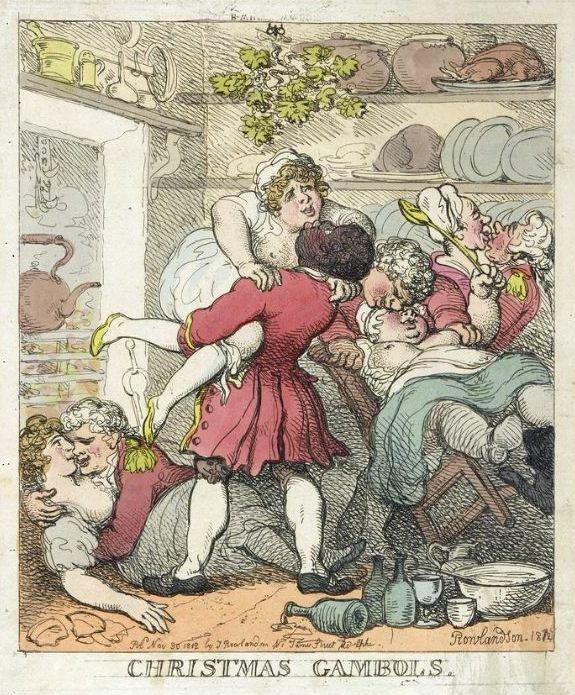 Thomas Rowlandson, Christmas Gambols, circa 1812. And a very merry holiday season to you as well sir. And thank you for sharing your knowledge and experience with us. I truly enjoy reading all your postings. I remain a loyal follower. Well that looks like a fun party. Let me know how the divorce goes. Thanks for all the things you share. I look forward to seeing emails show up in my inbox from you. Hope you have a great holiday season. We will be visiting you on New Years Eve for the fireworks in Sydney Harbor. I think I saw you at last night’s fireworks display at Sydney Harbour, but couldn’t attract your attention. I hope you have a healthy year and are spending an unusual amount of time in the shop. Like every one else, thank you for all the effort and time posting so much valuable and enjoyable information. To you as well Jack! Best wishes to you from Canada.